Hard to believe that a proponent of glue basting and lover of paint-on temporary stabilizer would ever consider purchasing a book with the word "couture" in it. But I did. Three days ago my copy of Couture Sewing: The Couture Cardigan Jacket - Sewing Secrets from a Chanel Collector by Claire B. Shaeffer arrived. And I was excited. My interest in the Chanel cardigan came very recently, right after I happened upon Chanel's The Making of the Cardigan video. (My original post about the video is here.) When I first saw the title of this new book, I thought I might learn some of the details of how the House of Chanel works with knits. Chanel shocked the fashion world when, early in her career, she began making suits from soft jersey knits she had purchased in quantity from textile manufacturer Jean Rodier. 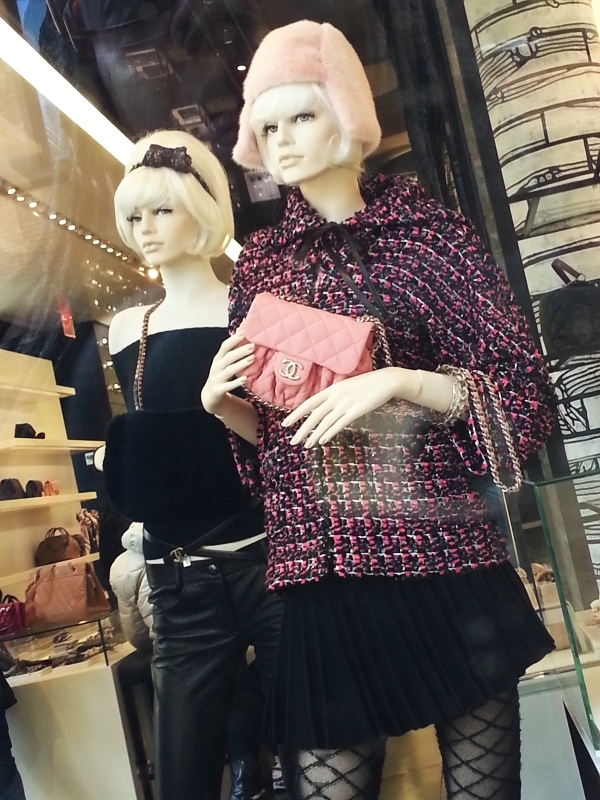 I'm quite aware that the Chanel jacket can also be constructed of beautiful woven fabrics. 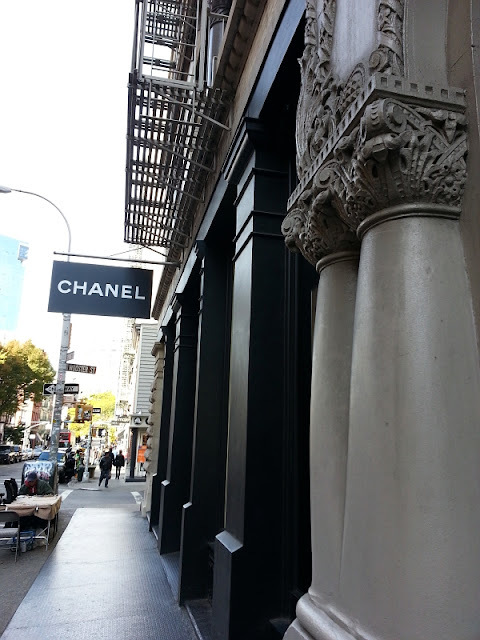 I pass by the "neighborhood" Chanel every day. Here's what was in the window this morning. The fabric. Always great fabric. I'm also aware that the cardigans being made in the video I saw previously, beautifully crafted as they are, are not couture. I guess the word "cardigan" in the book title is what threw me. It had been my understanding (or misunderstanding?) that a cardigan was always knitted or made of knit fabric. So true, the book is not what I'd expected, but on the way to looking for tidbits on working with knit fabrics, I found the book to be a spectacular resource. There are pictures of details from classic jackets: the fabrics, the buttons, the linings, the trims. The very best part of the book is the step-by-step instruction with clear pictures of the author demonstrating each step in the construction of a jacket. The included companion DVD has Shaeffer presenting a small portion of her personal collection of authentic Chanel suits, authorized copies, and knock-offs. Shaeffer then demonstrates each technique and talks you through the process. The instructions are clear and precise. Couture was never my goal. I've only wished to make a well sewn sweater. Several of Shaeffer's "sewing secrets", however, could have made my most recent jacket project easier (yes, easier!) and neater too. I'll be studying the book further. And speaking of my most recent jacket project, it's finished! I hand stitched the hem and front facings during Virtual Craft Night last night, my bow to Claire B. Shaeffer (and Chanel), I suppose. I'll take pics and post them soon. Disclosure: I paid for the book. This post contains affiliate links. Opinions are my own.